Although your guide will have flies for you, it is a good idea to bring a selection of flies. Many of the patterns listed below are commercially tied and available at reputable fly shops. 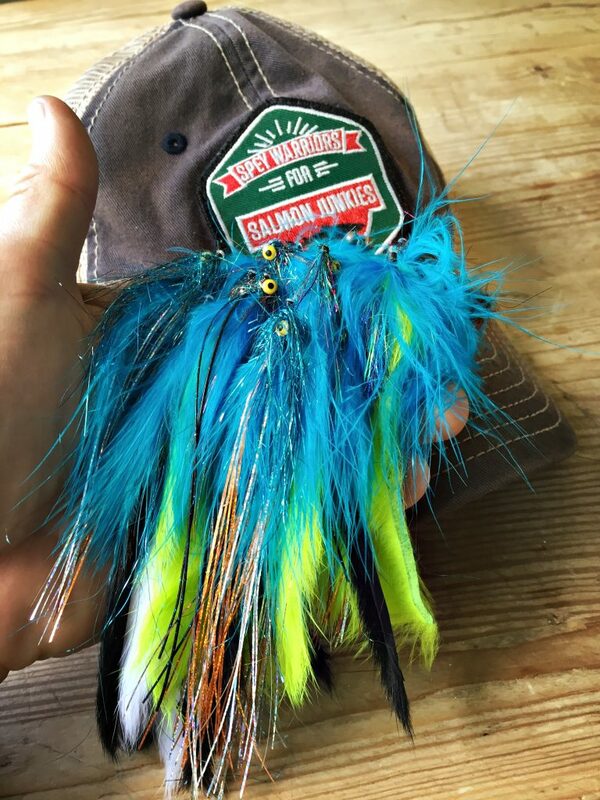 If you tie your own flies, please read on for information on characteristics that your hand-tied flies should incorporate. For the most part, Chinook flies should be of fairly good size, from 2.5 to 5 inches in length. Traditional style flies should be tied on top quality hooks in sizes from 4 to 2/0. Some of the key elements in Chinook wet flies (in order of importance) are motion, sink rate, size, color and flash. Motion: A fly with wiggle and motion generally has much better fish attracting qualities since it looks “alive” in the water. This is a highly attractive quality for Chinooks. Materials that help impart motion are rabbit fur, marabou, soft webby hackles, dubbings and mohair. Size and color: In general, the lower and clearer the water, the smaller and more subdued the fly, and vice versa. 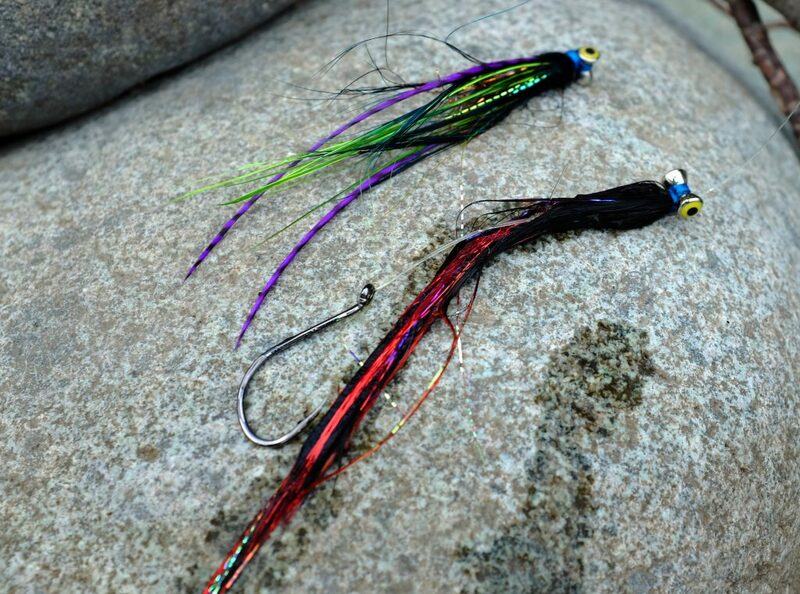 Favorite colors for wet flies are chartreuse, pink (cerise and shrimp pink), purple, black, blue, orange. Don’t be afraid to mix and match colors; favorite color combinations for Chinooks are chartreuse/blue, chartreuse/black, chartreuse/green, cerise/shrimp pink, black/blue, blue/purple and cerise/orange. Flash: Small amounts of flash included in standard patterns may help induce strikes from a following fish. And sometimes flies that are all flash are very effective in high, dirty water conditions. 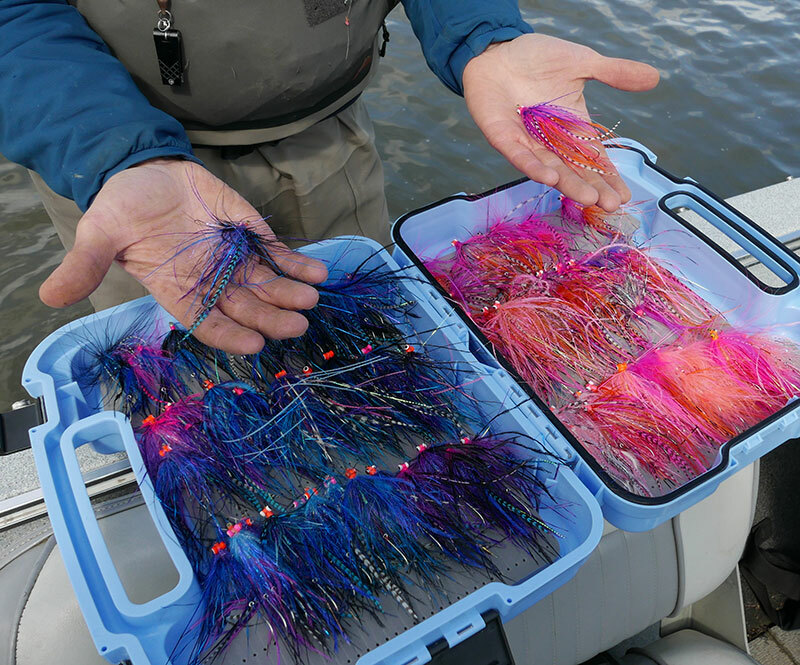 Many modern materials can help impart flash in your flies such as Flashabou, Crystal Flash, Cactus Chenille, Angel Hair, Edge Bright and many others..
Hooks: Hooks are critical in Chinook fly fishing. For tube and shank flies, sizes 1, 1/0, 2/0 and 3/0 are recommended and the Owner Super Needle Point SSW is a preferred brand and model. For smaller flies tied on traditional hooks, the tier may want to use strong saltwater hooks such as those designed for tarpon. Commercially tied flies: Many effective Chinook flies are available from fly shops and online sources. Common patterns include a variety of Intruder variations, prawns and leeches. Flies from the distributor Aqua Flies are highly recommended and serve as an example of effective designs. When smaller flies are required, traditional Comets, shrimp flies (including saltwater flies) and small Atlantic salmon tube flies such as Snaelda, Red Francis or similar may be effective. 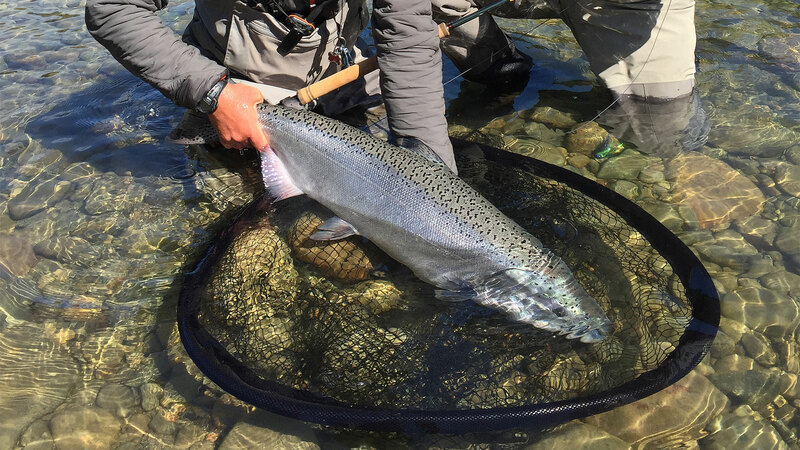 At Austral Lodge we adhere to a strict catch-and-release policy. All fishing is fly only, with single or double barbless hooks, and we request extreme care in handling all fish.